Subnautica is an evocative, occasionally terrifying underwater survival game that thrives on mystery. While it’s great to figure things out for yourself, sometimes swimming in circles gets old. Here are some tips for getting your sea legs. There are about as many ways to play Subnautica as there are terrifying monsters that will eat you. Here are some of the things I do, but feel free to add your own advice in the comments. I’ve tried to keep things pretty general to avoid spoiling plot points, but there are some gear and location spoilers if you’re just starting out. The scanner is one of the first tools the game will show you how to build with your fabricator, and it’s useful for a lot of reasons. Scanning flora and fauna will give you information about them and sometimes reveal new crafting recipes. Scanning furniture and building pieces will give you the ability to craft them. Scanning fragments you find on the sea floor will unlock the item’s blueprints once you’ve scanned the requisite number of fragments. For craftable items that need multiple pieces scanned, the game will show your progress on-screen. You can also look at your PDA’s blueprints section to see your progress. Subnautica will guide you to the first major plot point through radio signals (don’t neglect to repair the radio! ), but after that you’re on your own. To progress, actually read the PDA notes you get from the building the game guides you to. You’ll have to figure out where the next locations are on your own, though the game will give you a depth marker and some general coordinates. I only skimmed the data at first, and then spent too long swimming around, baffled and lost, before taking a closer look. You swim slightly faster if your hands are empty; press your equipped item’s hotkey to put your item away. I haven’t found the difference to be huge, but it can definitely be the dividing line between running out of oxygen and making it to the surface. It’s sparse, but it’s home. At first I thought chairs were just for decoration, but sitting in one keeps your stats from going down. Have a seat if you’re looking through your PDA or catching up on your logs. Sleeping in a bed will let you skip to daytime. It’s a great timesaver, and way more comfy than paddling around in the dark. I have the habit of dropping my unwanted items on the seafloor, where they take up a lot of space and can even slow the game down. Craft a trashcan to dispose of unwanted food and other stuff. You’ll need a nuclear waste disposal to get rid of your depleted nuclear reactor rods. Cooked fish start to decompose after a few minutes in your inventory, though uncooked fish will stay fresh. If you’re going on a long trip, you’re better off curing fish with salt. Once you get the thermal knife, you can cook fish on the fly (don’t forget to actually pick them up, though!). Toss it out into a cluster of fish and then snag the ones that get dragged in. If they wriggle a bit too much, the stasis rifle can keep them still. I like to grab a bunch of fish and toss them in my home base aquariums to save time on fishing. Farming is a great way to get food and water consistently. The game will guide you to where you can find fruit and tree samples, as well as where you can scan the interior growbed you’ll need to plant them in. Slashing a fruit instead of picking it will give you a seed. Be careful not to overfarm; always save a seed or two to replant. Farming is also good for things that aren’t food. I use an exterior growbed to grow things like acid mushrooms and gel sacks so I don’t have to go looking for them. Grab a sample of the fauna you find out in the world by slashing it with your knife and then plant it when you get back to base. The vending machine and coffee machine will give you an unlimited supply of sustenance. It’s not much of a stat boost compared to other food and water, but it’s something. Fight the urge to run. It’s worth it. It can be easy to overlook something when you’re racing your oxygen, but try to be patient and thorough when searching interiors for data and fragments, or when scanning the sea floor. I’ve found some essential goodies that I almost missed by taking the time to search every corner. I’ve also scoured the seabed for one last fragment, only to find it in a place I’d already explored. There’s no in-game map in Subnautica, which means it’s easy to get lost or forget where you saw something. I always bring a couple beacons with me when I’m away from home. When I find something cool or enter a new biome, I drop a beacon and label it. You can rename beacons by hovering your mouse over the front of it until the option appears to edit its title. Note that I’m sitting in my chair! You can change the color of your beacon markers from your PDA. I like to make resources one color and biomes another so I can tell them apart at a glance. If you haven’t found the blueprints for the battery or power cell charger, you don’t have to throw your dead batteries away. Use them to craft new items that require them. 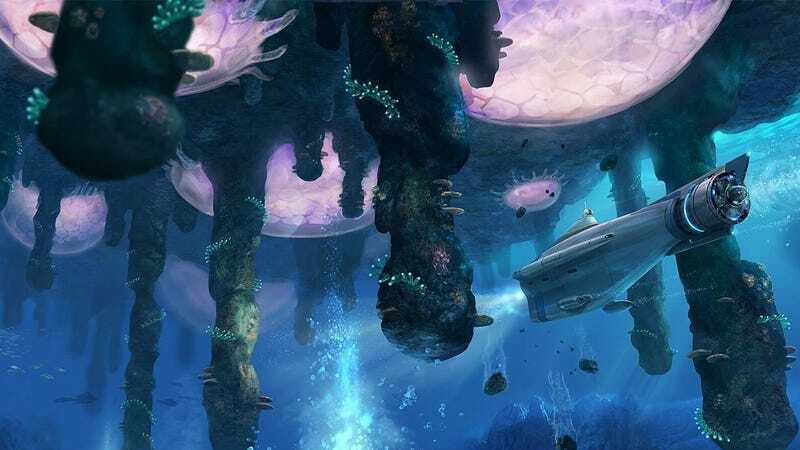 Subnautica is a game about going down, which means you’re going to need vehicles, and then you’re going to need to push those vehicles to go further. Where you actually craft these modules can be a little confusing. The first depth modules for the Seamoth and Prawn suit are crafted at the Vehicle Upgrade Station, which can only be built in a moonpool. The Cyclops depth 1 module can only be crafted at the Cyclops upgrade station on the Cyclops. All the other depth modules (2 and 3 for the Cyclops and Seamoth, and 2 for the Prawn suit) are crafted at the modification station. It’s a bit unwieldy to keep track of, and finding the third fragment for the modification station took me forever, but that’s the way it goes. OK, he wasn’t quite into it here, but I swear it works. If you’re carrying some scrap metal when a stalker attacks you, you can drop it in front of them and they should go after it. Not only will this get them off your tail, but you also might get some stalker teeth out of it, which you need for enameled glass. When I took the Seamoth to the Aurora, I accidentally got it stuck. I thought I was being clever by dislodging it by firing boxes at it—until it exploded. Pay attention to your vehicles’ health and stop to repair them often. When you first get the Prawn suit, the game will warn you not to feel overconfident. Please listen to the game and don’t be like me, who immediately took off across the seafloor and ended up stuck in a cave. The Prawn suit is great, but it’s hard to navigate. Reserve more serious exploration until you have the grappling hook. The drill arm is also a must-have for gathering resources from the deposits you’ll find in the depths. If you run out of materials while building, the thing you’re crafting will be inoperative but will persist in the world. This can be a good way to keep track of what you’re planning or best utilize your inventory space; start building an item with what you have, then come back when you have the rest of the materials. Home sweet home. Note my farms! The bigger your base, the less hull integrity it has; building in deeper waters will also affect integrity. If your base reaches zero integrity it will flood, and you’ll need to whip out your repair tool to patch the leaks. An easy way to add integrity is to build foundations. After that, build reinforcements on walls you don’t plan to expand (you can’t build on to reinforcements). Bulkheads will also increase your integrity, and they can be closed to keep floods from spreading. Subnautica doesn’t have the best inventory space, and if you’re far from home you’ll find yourself full up pretty quick. I tend to use the area under my lifepod as a home base, where my moonpool and upgrade stations are. I then build a few smaller outposts as I go. These outposts have battery and power cell chargers, a fabricator, a farm for food and water, maybe a medical kit fabricator, and just enough storage to empty my pockets. (You definitely don’t want to end up trekking all the way across the map for something you stored far away.) Don’t forget to drop a beacon so you can find your outposts again. You’ll find yourself with a ton of resources most of the time. You can label your lockers with what’s inside them for quick access. If you’ve found these you already know what they’re for. It’s good to have them with you, just in case. It’s probably weird to end some tips with “it’s OK to cheat,” but honestly I’ve used both a map and the excellent Subnautica wiki on more than one occasion. I’ve accidentally spoiled myself on a couple things, but often it was enough to get me back on track when I was frustrated and lost. If you’re really stuck and just want to keep moving, you can even bring up the developer console and spawn what you need.